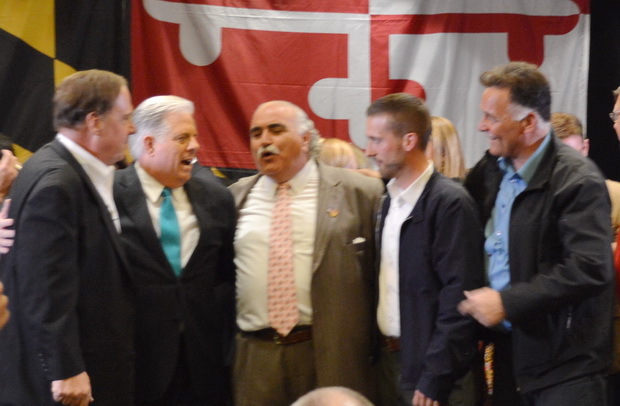 Above: Governor-elect Larry Hogan Jr., second from left, gets together with the men who sweeped out the Democrats in the Dundalk-Essex District 6. From left: Delegate-elect Bob Long, Hogan, Delegates-elect Ric Metzgar, Robin Grammer and Senator-elect Johnny Ray Salling. CORRECTION 11/5/2014, 1 p.m.: The original gains for Republicans in the House were based on earlier, incomplete returns. At this time, there are now likely seven additional GOP delegates for a total of 50. Maryland Republicans won big in the General Assembly as well as governor’s mansion, and will be sending nine more members of the House of Delegates and two more in the state senate. Joe Cluster, executive director of the state GOP, said they won about 90 percent of their targeted seats. The GOP will have 50 seats in the 141-seat House, when just months ago their leaders thought they would be lucky to hold onto the 43 seats they currently have, already a historic high number for Republicans in the Maryland House. It was the first election following a highly politicized redistricting process, and many incumbents chose not to run for their seats. Many decided to seek higher office or retire. The story continues below the chart of the party makeup of the next General Assembly. Tuesday night’s election results showed Republicans knocked out Democratic heavyweights Del. Norman Conway, chairman of the Appropriations Committee, in District 38B and appropriations subcommittee chair John Bohanan in St. Mary’s County District 29B. Republican challengers Carl Anderton, Jr. and Deb Rey, respectively, won the day in those races. In Cecil Count, Republican Kevin Bailey Hornberger beat Del. David Rudolph, a 20-year veteran who is vice chair of the Economic Matters Committee. In Dundalk, Republican Johnny Ray Salling beat frontrunner John Olszewski, Jr., “Johnny O” for the open Senate seat, garnering 47.9% of the vote compared to Olszewski’s 44.7%. In western Maryland, Democratic Del. Kevin Kelly lost his District 1B seat to Republican Jason C. Buckel and Democratic Del. John Donoghue lost to challenger Brett Wilson. Cluster said he would not be surprised if House Speaker Michael Busch, who has held that position for more than a decade, is not elected speaker in January. “Mike Busch is the biggest loser in this election,” Cluster said. As for their modest gains in the Senate, Cluster said, “The Senate (caucus) just didn’t have the funds.” to run for more seats. District 3: Democratic incumbent Sen. Ron Young has fended off Republican challenger Corey Stottlemyer. Young had 17,452 of the votes and Stottlemyer had 16,925, about 50.7% to 49.2%. District 29: In southern Maryland, Democratic incumbent Sen. Roy Dyson loses his seat to Republican Steve Waugh. Waugh had 21,338 votes and Dyson had 16,227, or 57% to 43%. District 38: On the Eastern Shore, Democratic incumbent Sen. Jim Mathias defended his seat from Republican challenger Mike McDermott. Mathias had 19,133 votes (51.6%); McDermott 17,905 (48.3%). District 42: Democratic incumbent Sen. Jim Brochin holds onto his seat by about 500 votes. Brochin had 51.4%, or 22,815 votes. Republican challenger Tim Robinson got 48.3% with 21,325 votes. District 6: In Dundalk-Essex, Republican Johnny Ray Sailing beat frontrunner John Olszewski, Jr., “Johnny O” for the open Senate seat, garnering 48% of the vote (14,587) compared to Olszewski’s 45% (13,612). Unaffiliated candidate Scott M. Collier had 2,216 votes. District 9: Republican Del. Gail Bates will take the open Howard County seat, handily defeating Ryan Frederic, a Democrat, 32,015 (66%) to 16,536 (34%). District 13: Democratic Del. Guy Guzzone will take the seat vacated by retiring Jim Robey. Guzzone got 24,105 (62%) compared to Republican Jody Venkatesan’s 14,662 (38%). District 34: In Harford County, Republican former county councilman Bob Cassilly held onto Republican seat, defeating Democratic Del. Mary-Dulany James. The seat was vacated by retiring Sen. Nancy Jacobs. Cassilly had 21,274 or 57.2%, compared to James’ 15,854, or 42.6%. District 35: Republican Del. Wayne Norman of Bel Air won by a large margin, with 30,264 over Democrat Bridget Kelly, of Perryville, with only 10,630 votes. The percentages were nearly 74% compared to 26%. District 1B: In Cumberland, Del. Kevin Kelly, a six-term Democrat, lost to Republican Jason C. Buckel. Buckel had 6,448, or 59%, compared to Kelly’s 4,392 or 41%. District 2B: Hagerstown Democratic Del. John Donoghue, a six-term incumbent, lost by about 600 votes to Republican challenger Brett Wilson. Wilson had 3,680, or 55%, compared to Donoghue’s 3,023, or 45%. District 3A: Frederick Democrats Carol Krimm and Karen Lewis Young, who is the wife of Sen. Ron Young, will take these open seats. Krimm got 11,073 votes; Young 10,394, defeating Republicans Frederick County Commissioner Paul Smith (9,435) and Victoria Wilkins (8,513). District 12: In this completely open district, Democrats Eric Ebersole (Baltimore County), Terri L. Hill (Columbia) and Clarence Lam (Columbia) all won, defeating Republicans Gordon Bull (Baltimore County), Joe Hooe (Baltimore County), Rick Martel (Baltimore County). Incumbent Dels. Steven DeBoy, Jimmy Malone and Liz Bobo had all decided not to run. Ebersole had 18,479; Hill 18,414; Lam 17,786; Bull 13,600; Hoe 15,563; Martek 13,716; Write-ins 106. District 27C: In a Calvert County rematch, Republican Mark Fisher beat former Del. Sue Kullen, a Democrat, 8,751 (58%) to 6,274 (42%). District 29B: St. Mary’s County Del. John Bohanan, a Democrat, was ousted by Republican Deb Rey, with Rey getting 5,148 (51%) to Bohanan’s 5,033 (49%). District 30A: Republican Del. Herb McMillan was the top vote-getter in this Anne Arundel County district, overtaking House Speaker Mike Busch, a Democrat, who will retain his seat since it is a two-member district. McMillan had 13,642 votes (28%); Busch 13,352 (27%); and Democrat Chuck Ferrar had 11,159 (23%) and Republican Genevieve Lindner had 10,470 (22%). Write-ins were 53. District 30B: Seth Howard will pick up this seat for the Republicans, with 9,108 (or 63%) of the vote compared to Democrat Mitchelle Stephenson’s 5,238 (36%). District 31B: Republican Meagan Simonaire, daughter of Sen. Bryan Simonaire, will pick up the seat of Del. Don Dwyer, who was ousted in the primary. Simonaire and Republican Del. Nic Kipke won the race with Kipke, 20,174, or 40%, Simonaire, 18,926 or 38%, beating Democrats Jeremiah Chiappelli (6,082 or 12%) and Doug Morris (5,156 or 10%). District 38B: Del. Norman Conway, a seven-term Democrat who chairs the Appropriations Committee, has been ousted by Republican Carl Anderton, Jr. The Republican had 5,395, or 53%, compared to Conway’s 4,828, or 47%. District 40: In Baltimore City, newcomer Antonio Hayes was the top vote getter with 13,685 or 32% of the vote. Democrats Del. Frank M. Conaway Jr. and Del. Barbara A. Robinson will retain their seats and Del. Shawn Tarrant’s write-in campaign fell short with only 3,084 total votes or about 7%. Conaway had 13,124, or 31% and Robinson had 13,209 or 31%. District 42B: Republican Del. Susan L. Aumann will retain her seat and serve alongside Republican lawyer Chris West. Aumann had 22,265 (39%); West 19,123 (33%), winning over Democrats Robert Leonard with 8,539 (15%) and Craig Little with 7,315 (13%).